"I'm a sucker for dogs and a totally failed fosterer!" ​​Browsing on Facebook I came across a post about a gorgeous little lost dog with people desperately trying to find her. I just had to follow the page! I wasn’t able to go out and join the search, but got involved by emailing vets and posting flyers to try and help reunite her with her family. 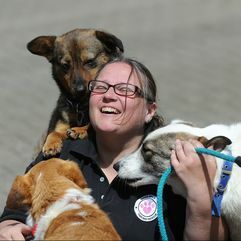 That’s how I first came across Rachael and Dogs Walk This Way Rescue. I started to follow her page and suggested some fundraising ideas to help her. Next thing I knew, I’d agreed to foster a Romanian rescue dog while I was on holiday from work. I’m still not sure how that happened?! I hadn’t even met Rachael yet! After my successful home check, Rita the rescue moved in with me. A week later I got a message from Rachael to say someone wanted to meet Rita with a view to adopting her. There was no way I could let her go, I was totally smitten. ​​I had to do a bit of re-organising of my life, including making arrangements with my job to allow me to work from home a few days a week. Knowing I was a soft touch, Rachael asked me if I’d be interested in helping the rescue. Karen help dogs? A no brainer. I didn’t even hesitate before saying yes. And here I still am, 3 years later. Thanks to Rachael’s inability to let any animal suffer, I ended up with two cats she rescued whilst on holiday in Cyprus. She’s very persuasive! But I wouldn’t have it any other way. Jess, my British born rescue with her adopted sister Rita. They love each other!